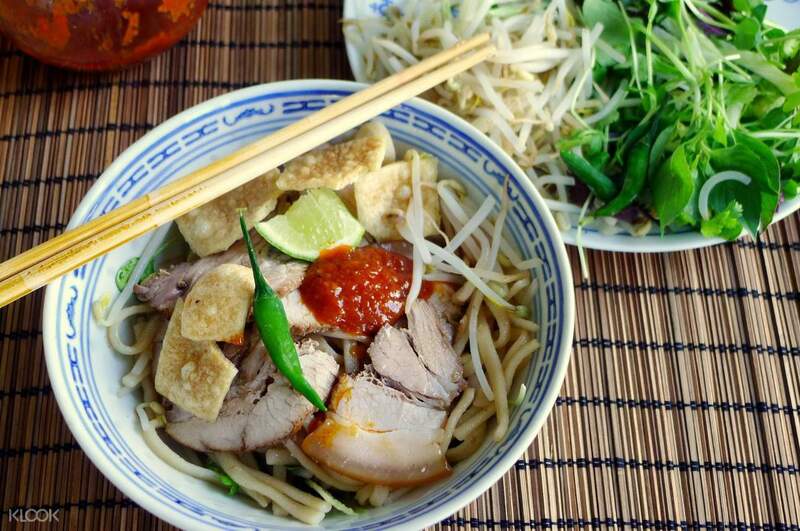 Feast on local food for dinner and get to try Hoi An classics such as Cao Lau, Nem Lui, Banh Xeo, and more! Learn more about Vietnam's Buddhist origins and ancient history in this tour. 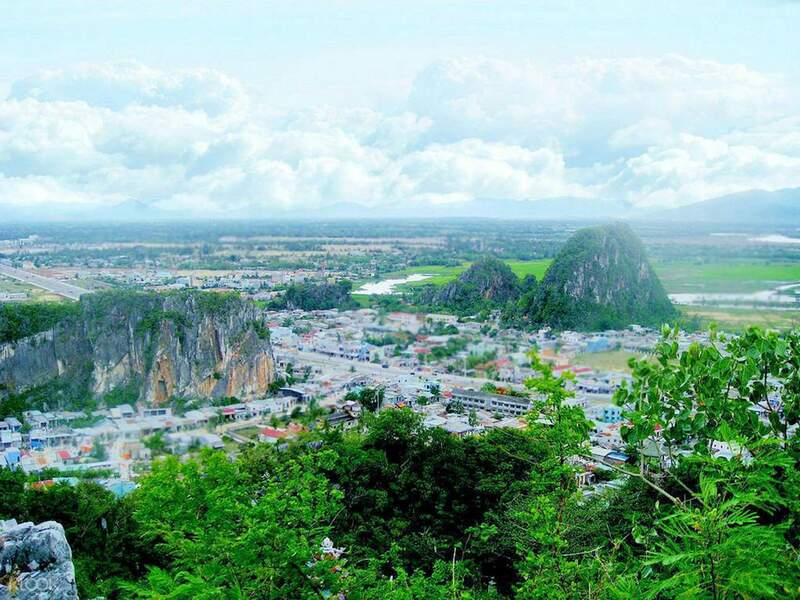 Get to visit Marble Mountain and its complex of five marble and limestone hills that represent the five main elements of the universe - Iron Mountain (Kim), Wood Mountain (Moc), Water Mountain (Thuy), Fire Mountain (Hoa), and Earth Mountain (Tho). Explore these works of nature and discover Buddhist pilgrimage sites and sanctuaries, such as Tam Thai Pagoda and Linh Ung Pagoda. Head down to the foot of the mountain and meet the skilled artisans of Non Nuoc Stone Sculpture Village. 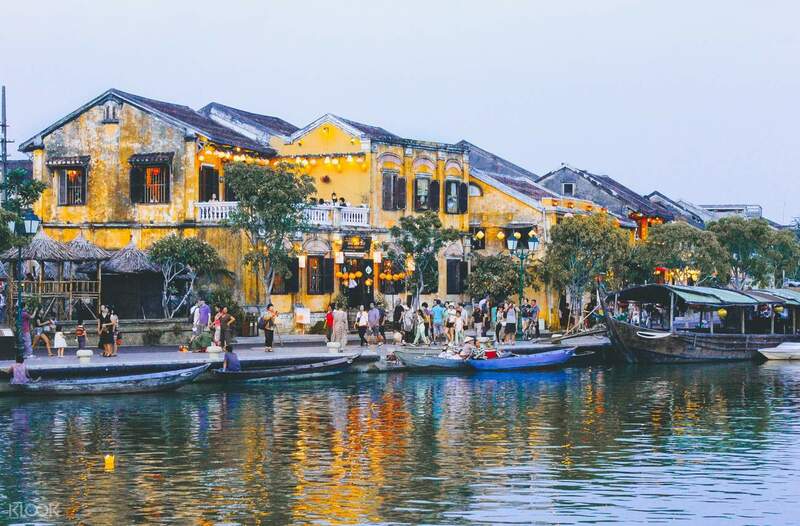 After an educational interaction with the locals, head to Hoi An by foot. Fill up on local favorites for dinner and walk around the lantern-lit streets of the ancient town. End the tour with a ride back to your hotel. Our guide for this trip is a very young and funny Thoa. Although it’s raining so hard that time, she still managed to make this tour possible. Since it’s raining, we haven’t got the chance to really enter the caves in the Marble Mountains since it’s so dark and somehow scary. The visit in Hoi An was so amazing!! I have to highlight that I was soooo amazed by the food that’s included in this package, it is 8kinds of local food and yummy! Our guide for this trip is a very young and funny Thoa. Although it’s raining so hard that time, she still managed to make this tour possible. Since it’s raining, we haven’t got the chance to really enter the caves in the Marble Mountains since it’s so dark and somehow scary. The visit in Hoi An was so amazing!! I have to highlight that I was soooo amazed by the food that’s included in this package, it is 8kinds of local food and yummy! Interestinf visit at the caves and Hoi An at night! its quite crowded during night time but the lanterns are stunning! Met nice fellow tour group mates! Interestinf visit at the caves and Hoi An at night! its quite crowded during night time but the lanterns are stunning! Met nice fellow tour group mates! marble mountains were just amazing. in start i was expecting there will not muchh than small caves..but it had beautiful caves and statues. a mangnificient pagoda and a beautiful view. marble mountains were just amazing. in start i was expecting there will not muchh than small caves..but it had beautiful caves and statues. a mangnificient pagoda and a beautiful view. You have make yourself fit because need to climb up to 125 steps staircase (I guest?) to see the sunset if you lucky ...Half day evening trip to Mable mountain and Hui An with a beautiful sunset is a memorable for me. But,the dinner is not up to expection and hope they can improve it. You have make yourself fit because need to climb up to 125 steps staircase (I guest?) to see the sunset if you lucky ...Half day evening trip to Mable mountain and Hui An with a beautiful sunset is a memorable for me. But,the dinner is not up to expection and hope they can improve it. Booking with Klook was easy but the driver kept changing the time for pick up. From 3-3.30pm to 3.45-4pm. Marble mountain is a very short distance from DaNang city. Not advisable for kids n seniors or those with weak knees as there are many steps n rocky. Beautiful caves with Buddha status...tour guide will explain the history. Tour followed by 8 dishes dinner in Hoi An. Love the Hoi An food with lots of vegetables. Tour Hoi An old town. Basically Hoi An is full of old houses with colourful lanterns. The owner opens their house, converting their living hall into shops & restaurants. There is a light up river with boats for tourists - very rich in culture with 100-200 years history. Because it’s a joined tour we don’t have much time for the night market. Just a few hours for Hoi An is definitely not enough. Will visit Hoi An again. Booking with Klook was easy but the driver kept changing the time for pick up. From 3-3.30pm to 3.45-4pm. Marble mountain is a very short distance from DaNang city. Not advisable for kids n seniors or those with weak knees as there are many steps n rocky. Beautiful caves with Buddha status...tour guide will explain the history. Tour followed by 8 dishes dinner in Hoi An. Love the Hoi An food with lots of vegetables. Tour Hoi An old town. Basically Hoi An is full of old houses with colourful lanterns. The owner opens their house, converting their living hall into shops & restaurants. There is a light up river with boats for tourists - very rich in culture with 100-200 years history. Because it’s a joined tour we don’t have much time for the night market. Just a few hours for Hoi An is definitely not enough. Will visit Hoi An again. The tour is enjoyable and interesting. Meal in Hoian city was pleasant. I would like to commend the guide for her extra effort to provide assistance to us. The only part of the tour that proved challenging to me is the hiking at marble mountain which are not appropriate for elderly tourists. However, they can still enjoy the lovely town of hoi an city at night. The tour is enjoyable and interesting. Meal in Hoian city was pleasant. I would like to commend the guide for her extra effort to provide assistance to us. The only part of the tour that proved challenging to me is the hiking at marble mountain which are not appropriate for elderly tourists. 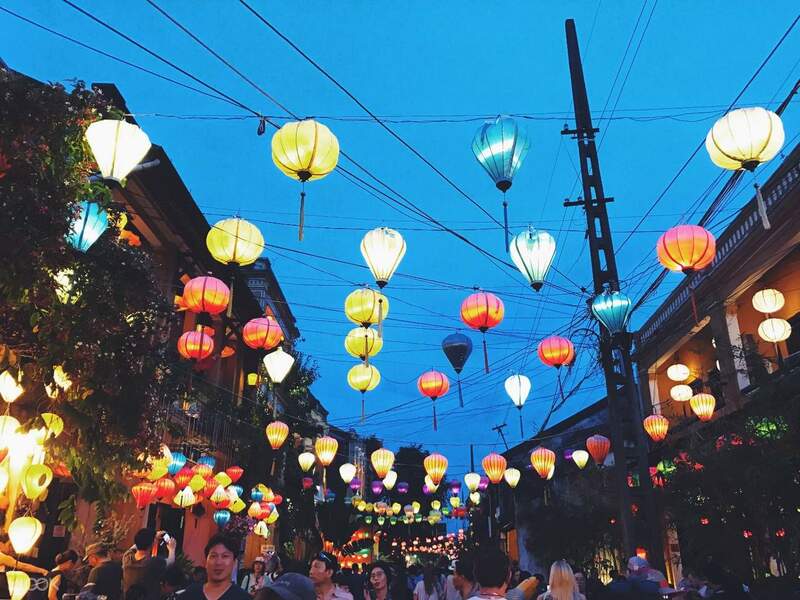 However, they can still enjoy the lovely town of hoi an city at night. It was a wonderful tour bringing us to the Water Mountain which was the most spectacular among the Marble Mountains. After that the guide brought us to enjoy a very delicious local meal in a nice restaurant to load us with full power for the walking tour in Hoi An ancient city. The night view of Hoi An was fascinating, unforgettable. The guide gave us lively explaination of the geography and history of Da Nang and Hoi An regions. Highly recommended tour! It was a wonderful tour bringing us to the Water Mountain which was the most spectacular among the Marble Mountains. After that the guide brought us to enjoy a very delicious local meal in a nice restaurant to load us with full power for the walking tour in Hoi An ancient city. The night view of Hoi An was fascinating, unforgettable. The guide gave us lively explaination of the geography and history of Da Nang and Hoi An regions. Highly recommended tour! Great experience & journey to the marble mountain. 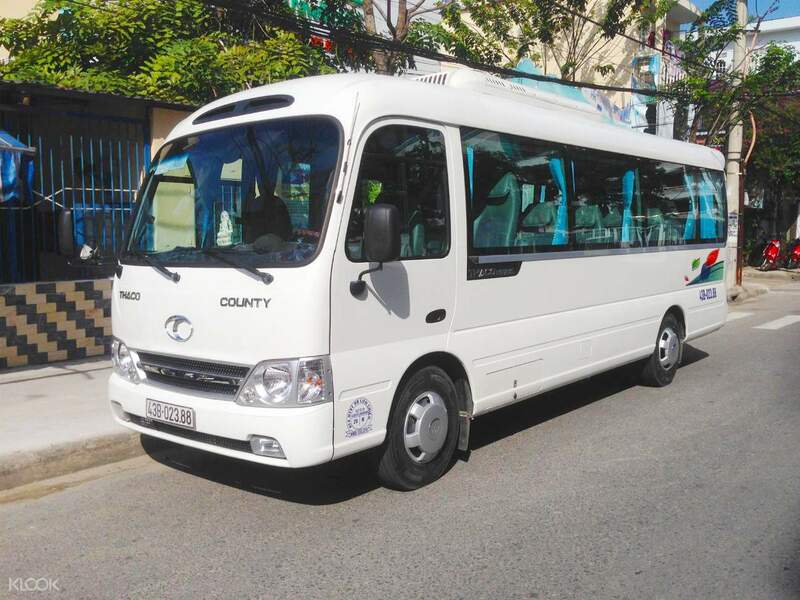 Experienced tour guide bring us around. Hoi An town is really beautiful. Nice view! Recommended to visit all these places. Great experience & journey to the marble mountain. Experienced tour guide bring us around. Hoi An town is really beautiful. Nice view! Recommended to visit all these places. It was okay. The tour guide was very nice and did her best. The tour was a bit confusing to me though. As far as I understood, we were to take a LIFT up the marble mountain. But then when we arrived, we had to climb like 50 flights of steep, uneven stairs. As someone with asthma, this was very difficult for me. I almost passed out. And then we were taken to a marble selling store despite it not being in the itinerary. Good thing Hoi An was very beautiful and stunning. It was okay. The tour guide was very nice and did her best. The tour was a bit confusing to me though. As far as I understood, we were to take a LIFT up the marble mountain. But then when we arrived, we had to climb like 50 flights of steep, uneven stairs. As someone with asthma, this was very difficult for me. I almost passed out. And then we were taken to a marble selling store despite it not being in the itinerary. Good thing Hoi An was very beautiful and stunning.